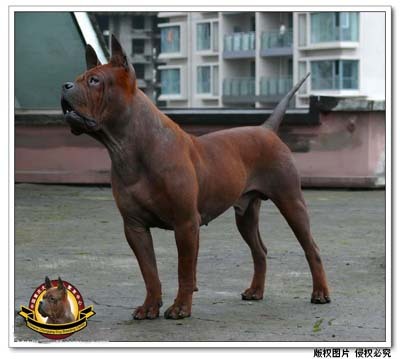 The Chinese Chongqing dog is an ancient and unique breed which thought to have been in existence since the Han dynasty in China for more than 2000 years. The origin of this breed which you have probably never seen before is Chongqing region where located in the mountain area of southwest China. For separating from outside world, this breed forms its unique appearance and temperament in the long term of natural evolution. Few people know the breed in the world. It is even rare in China. Bien rara esa raza nunca había oído hablar de ella. Parece como un revoltillo de Shar pei, pelado chino, Akita y Boxer.